San Diego 101: Things You Need to Know! I've been giving advice to tourists since 1996 and have answered a lot of questions. Well, maybe the same questions a lot of times! But that's OK, I know you just want to plan out your best vacation to San Diego ever and I'm here to help. Where to eat? What to do? Where to stay? Think you don't need to read this section? See that photo to the left? The one taken in the summer with the poor tourists in swimming suits wondering where the sun went? If only they read Local Wally's FAQ's on San Diego first because then they'd know about our June Gloom and would have packed a sweatshirt instead of a speedo. So read on to see what questions pop up again and again and if I missed one please feel free to email me for free and unbiased advice! Maybe the question shouldbe "when is the worst time to visit San Diego"? I sure hope you didn't book your trip for anytime from end of May to the beginning of July because this is the time for our infamous June Gloom, otherwise known as vacation ruining overcast skies. It's serious stuff - terrible gloomy weather that destroys any chance of having a good time at the beach, a sweatshirt kind of vacation. It always happens, every year, and that's why you should never come during June unless you are willing to roll the dice and pray to the Sun God that the clouds melt away. My favorite time to visit is Fall when the weather and ocean are still warm but the crowds fewer. What's the Weather Like in San Diego? I'm sure you can google this to get the exact average temperatures but let me put it this way. From mid-June through October it's mainly shorts and flip flop weather with a light jacket at night. November is usually nice enough that I BBQ a turkey though the ocean has cooled down enough that my wife won't even put her toes into the water. December cools a bit but my family tradition is to walk on the beach on Christmas day. Jan through March is typically cooler, maybe wear a real jacket on some days and even some rain, but by April and May the weather turns super nice and sunny. 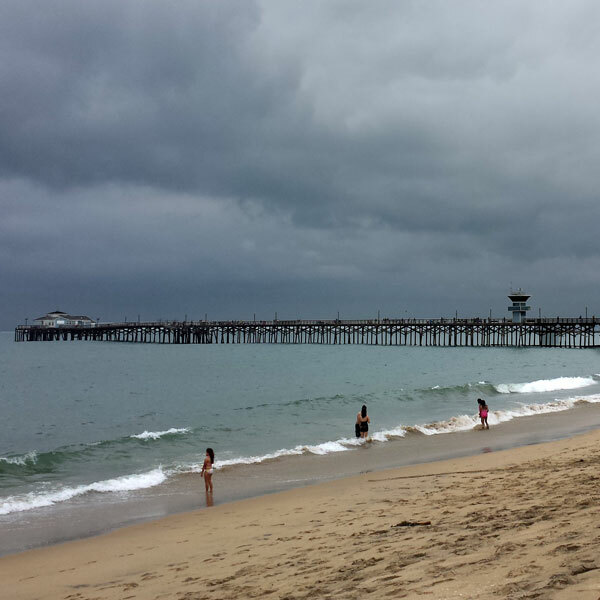 If you have been paying attention from end of May through June is June Gloom, overcast skies. Basically we wear shorts and flip flops half the year, jeans and a hoodie the other half. We don't get that much rain but when it does we like it - for a day or so, and then it better get sunny again! But what happens if you are here on vacation and it rains? Don't worry, your vacation isn't ruined. Just go to Balboa Park where you'll visit tons of cool museums, all inside, or head up to Temecula for some wine tasting. Like Beer? San Diego has a ton of breweries that are fun to visit on a rainy day (go to DrinkUpSanDiego.com for a list of the 100+ breweries). And even on a cool or misty day, visiting the tide pools or the seals in La Jolla is always fun. Yes. San Diego is really spread out so if your plan is to see it all you should rent a car. Forget about the red trolley cars unless you are trying to get into Gaslamp Quarters on a baseball night or during Comic-Con. Of course you could take the bus (and here's their handy trip planner) but I wouldn't - not on vacation! San Diego does have pretty good Uber services but do the math before relying on it as, once again, San Diego is really big and spread out. Most people who come to San Diego want a tropical paradise, a place near the water, so I vote for Mission Bay. My favorite place there is Paradise Point Resort, a sprawling resort area surrounded by water with one story bungalows instead of high rise hotel buildings. It feels just like Hawaii there and is great for honeymoons and family vacations. For true beach front resorts the Hotel Del Coronado is my top pick, a historical hotel with all the amenities right on a great family beach. It can get pricey, though, so those on a tighter budget who still want an ocean vacation should check out The Blue Sea Lodge, a motel on the beach that's been recently remodeled into a hip hotel, or The Catamaran on the Bay which usually has good rates and is family friendly. Stay in San Diego in Luxury.... on a Budget! What is the Best Restaurant in San Diego? San Diego's food scene has really amped up recently with a lot of great foodie restaurants opening in the older, more urban areas of town like North Park and Hillcrest. But there has been on restaurant that has always been my top pick for the ultimate San Diego dining experience and that's George's at the Cove's Ocean Terrace. The view of La Jolla Cove is amazing and the food is a good representation of California Casual and moderately priced. We also have tons of great Mexican restaurants and lots of seafood so go to my Restaurant Section for all of the good eats in San Diego. Where are the Cheap Eats in San Diego? One word: tacos. If you want to eat cheap but still good in San Diego just stick with tacos. And San Diego has lots of tacos and taco shops. A real taco shop should be a bit sketchy, a bit confusing, but rewards you with authentic and cheap Mexican food. Roberto's is the local champ and if you pay attention you'll see plenty of knock offs with names like Alibertos, Hilibertos, Abiertos, and maybe someday a Wallybertos. Pretty much all of them are good and all of them cheap. Locals also love Las Quatro Milpas near the Gaslamp District, a run down restaurant with a line down the block where the rice and beans all go into a bowl with a freshly made tortilla on the side. For those who want a more family friendly place head to El Indio, a San Diego institution that invented the taquito (aka rolled taco) where a tamale smothered in beans is less than $5. Where are the Best Places to Eat with a Family? When I think "family dining" I'm thinking "mom and dad need a drink in a setting where it's noisy enough that no one cares if the kids are misbehaving". That said, I would aim my GPS to any Mexican restaurant and order a Perfect Margarita on the rocks with a salted rim. Other alternatives are pizza joints like Pizza Nova near Shelter Island, Corvette Diner is super fun for the family with a 50's theme and great food, or even Phil's BBQ, though the line can get insane. For an unusual but excellent spot that gives you good food, great view, and cheap prices, go to Toby's 19th Hole at the Balboa Golf Course. It's a super old school restaurant that looks like it's 1955 but has a view overlooking the golf course and skyline and pitchers of beer for less than $10. What are the "Don't Miss" Attractions in San Diego? Believe me when I tell you that San Diego has so many good things to do that it's hard to pack it all into a week but if you made me pick the essential attractions I would tell you to go to the San Diego Zoo, visit Balboa Park with a museum pass, then do something in the water like kayaking the caves of La Jolla or just hanging out at the beach. That actually pretty much describes my lifestyle, by the way! Don't be jealous. OK, be a little jealous. Should I go to Mexico? Ask a local this question and you will get different advice. Some will tell you of the crime and long waits at the border, others will tell you that Mexico and Tijuana particularly has changed and is now safe. I personally think it's a good day trip (not a night trip!). Go early in the morning and just hit up the main "Revolucion" area. Yes, it's touristy and yes, you will find painted donkeys that look like zebras and lots of fairly terrible margaritas but it's still a fun adventure. For those less inclined to go at it alone there are plenty of tours that will take you to the taco stands - Club Tengo Hambre does a good job and is a nice way to do TJ without the fear of food poisoning or run in's with drug lords. San Diego is pretty casual with most locals wearing shorts and flip flops during the summer. If you plan on going to a nicer restaurant you won't need anything fancier than "business casual" - ugh, sorry to kill the vacation vibe with that description but you know what I mean. So shorts, jeans, casual wear is perfect. And wear sunscreen! Nothing screams "tourist" louder than a lobster red sunburn. How Do I Get my Business into Local Wally? If you think your business should be in my guide just shoot me an email. All of my reviews are real and unbiased but I'm always open to adding new restaurants, new destinations, and new tourist ideas. I have spots for local advertising as well or we can work together on a blog post if your business makes for good content for my readers.